Okra’s popularity continues to rise as overall sales crossed the $20 million mark. More and more consumers are being drawn to this staple of Southern cooking. Use its rising popularity to boost your sales. Okra offers up some little-known health benefits. It contains magnesium, which can help prevent osteoporosis. Okra is a good source of folate, which helps prevent neural tube birth defects. It contains vitamin A, which helps keep eyes healthy. Okra also contains thiamin, which is important for brain function. 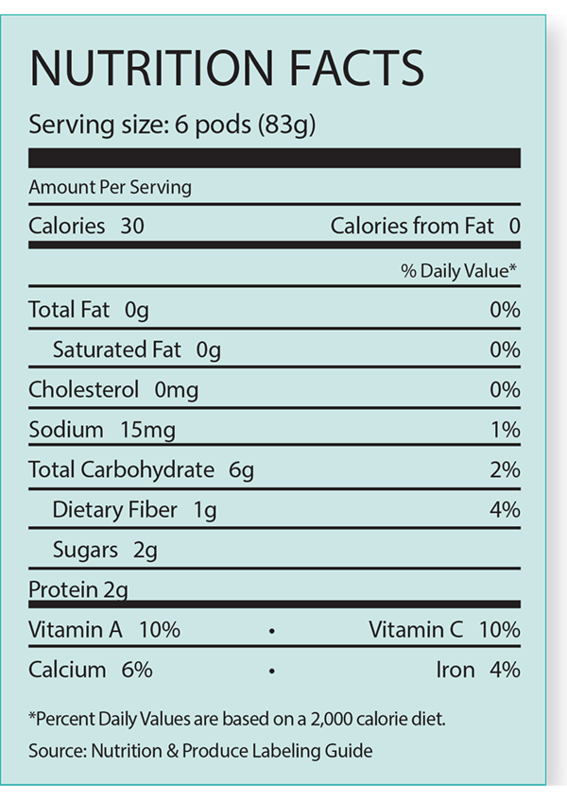 The U.S. Food and Drug Administration has approved the following nutrient content descriptors for okra: fat-free, saturated fat-free, very low sodium, cholesterol-free, low in calories, a good source of vitamin A, a good source of folate, a good source of thiamin, and a good source of magnesium. Okra sales grew again in 2016, increasing by more than 18%. Higher prices accounted for much of the increase as volume rose just 3.4%. Okra is rarely eaten without being cooked in something so cross-merchandise it with bread crumbs, vegetable oil, pickling spices and canning jars. Okra is available year-round, but its peak season is in the summer. Offer promotions to keep okra moving throughout the year. Fall: Include okra in soup displays as it adds a distinct flavor to soups and stews. Include okra in canning promotions. Winter: Promote fried okra as a hearty side dish for wintertime meals. Spring: Okra shines during Mardi Gras, so be sure to have it on hand as it is a main ingredient in gumbo. Create a Mardi Gras themed-display that includes okra. Summer: Okra has traditionally been a part of summertime meals in the South. Use this time of year to introduce it to new consumers. Okra does not keep well. Only bring in what you will sell in a day. Offer consumers options by offering both bulk and packaged okra. Keep packages to a pound or less as a little okra goes a long way. Display okra with other traditional Southern items like kale and other greens. Encourage consumers to try okra by using signs to educate them about its uses. Don’t cook okra in iron, copper or brass pans. A chemical reaction occurs that turns the okra pods black. Okra turns pasty when it is overcooked, so be sure to keep its cooking time to a minimum. Use okra to create gumbo during Mardi Gras to attract customers wanting to celebrate. Okra can be added to salads for a unique flavor. Include okra in soups and stews. Serve fried okra as a hearty comfort food side dish. Temperature: 43 to 45 F (7.2 to 10 C) Relative humidity: 85-95% Mist: no Typical shelf life: 7 to 10 days Ethylene-sensitive (Do not store or transport ethylene-sensitive items with commodities that produce ethylene.) Highly sensitive to freezing injury. (Likely to suffer injury by one light freezing.) Susceptible to chilling injury (Damage sometimes is not apparent until produce is returned to a higher temperature.) Do not ice or sprinkle product on display. Okra needs careful handling as it deteriorates and bruises easily. Average length of a pod is 1 1⁄2 to 3 inches.